There's an interesting mystery at the beginning of Joshua Williamson's Rebirth Flash Vol. 5: Negative, but that momentum is squandered in a generic fight with a forgettable villain and inconsistent character work. Once again, Williamson's Flash defies explanation; the writer of the superlative Justice League vs. Suicide Squad populates this book with unlikable characters and overlays a general sense of malaise. 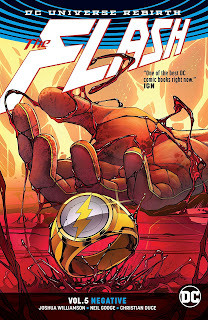 My fervent hope was that Negative would mark the end of this book's "negative" bent, but it hasn't happened yet; if all of this is meant to be part of some "Flash is possessed" story thread, hopefully it resolves itself soon. The titular two-part "Negative" story is the book's best, as CSI Barry Allen teams with some rough Central City PD colleagues to take down a traitor within. Barry's unsmiling companions give this police procedural a noirish air, and Williamson offers enough red herrings for me to suspect each of them before the culprit's revealed. That Williamson's Barry is a mess personally and professionally is this part's main detriment -- he's basically dragged through the story by the others -- but at least in terms of keeping me guessing, Williamson does well here. But "Negative" gives way to the two-part "Bloodwork," in which Flash has a fairly typical fight with generic new villain Bloodwork in the vein of Spider-Man's Venom or Carnage. I see the minimal, predictable thematic ties between Bloodwork and the Flash's errant powers and emotional situation, but there's no strong sense Bloodwork matters, nor the troubles within the CCPD built up over the last issues, nor that we'll likely encounter any of this again. Bloodwork's motivations, that the Flash is an "infection in Central City," are so naive and confused as to make him nothing more than just a one-note villain. In the build up, the story showed promise, but in the denouement, I've a sense of Williamson just marking time -- till the Metal tie-in, till "Flash War" -- with filler. And as I've been wont to say, there is a gigantic difference between a hero breaking bad -- Batman, gone fugitive; Superman, possessed by the Eradicator; Hal Jordan, recent rebel from the Corps -- and Williamson's jerky Barry Allen. Barry, less than ten pages into the book, is already whining with his new "negative" powers (forced on him by the Reverse Flash) that "Thawne was right. I hurt everything I touch" -- and then he goes on for two pages about how it's too hot outside. And that's just before Barry belittles a well-meaning college, that he doesn't have time for "water cooler talk," and two issues before Barry literally screams at his whole office and dares his boss to fire him. I recognize much of this is meant to reflect the influence of the "Negative Speed Force" on Barry (loosely defined as that is). But it is not a far cry from the way Williamson's Barry has acted so far in this title sans Negative Speed Force either -- a Barry Allen who's been wallowing in his own self-pity for thirty issues now, wholly dismissive of his friends even as Williamson, incongruously, lines up witness after witness to attest to how optimistic Barry supposedly is. Consider that hardly at all here does Barry try to get to the bottom of how his greatest enemy apparently poisoned him, taking it instead as a deserved punishment instead of, say, consulting Batman about it. It does not help that Barry's climactic breakdown here is drawn by Neil Googe, an artist with an animated style best meant for lighter fare -- a scene Williamson means to be taken seriously looks like a child throwing a tantrum. Labored as it is, I hoped for a turnaround toward the end when Barry resolves to be more positive and Kid Flash lends a hand (only, of course, to also be a jerk to Barry later). But the same issue sees Barry sanctimoniously lecturing his new CCPD partner on how the excesses of Iron Heights are a justified punishment for the Rogues -- given what Barry's attitude should be as a hero and in light of his father's long false imprisonment, I can only hope there's a ruse in play -- and then again whining about his mistakes before the book ends. Williamson's new outlook for Barry barely lasts an issue, and I'm stymied what model from the past Williamson is using as his basis for what Barry is like. Flash Vol. 5: Negative lives up to its title, if not up to the legacy of its title character. There's one more volume between this and "Flash War," which seems to have some core Rebirth ties. I'm very hopeful, since not by the twenty-fifth issue, then at least by the fiftieth perhaps Joshua Williamson will pull back the curtain and reveal a Barry Allen being influenced this whole time. At some point we'll be able to determine if Williamson is up to something (for perhaps too long a time) or if this is just how he perceives the Flash; I keep reading in part to find out which it is. I won't spoil the next story, but aside from some great Wally West(original) moments, the antagonist and some great art work, Barry is still unlikable and frustrating. This is the dreariest Flash run I've ever read, and that's including the Bilson/DeMeo issues. How can a book about the fastest man alive be so...blah?